Located only seven miles off the Massachusetts coastline, Martha’s Vineyard is a 45-minute ferry ride from Woods Hole or Hyannis. Although the island is about 10 by 20 miles in size, cars are not a necessity during the summer months because shuttles and trolleys transport vacationers from town to town. Visitors who do plan to bring a car are encouraged to make reservations early. Outside of the bustling harbors and busy villages lie huge tracts of undeveloped land and miles of coastline. Much of the land is wild and natural, with numerous farms and nature preserves. Ferries arrive either in Vineyard Haven or Oak Bluffs. Vineyard Haven, which was once one of the busiest ports in the world, has the neighborhood atmosphere of a fishing village. Oak Bluffs is known for its whimsical "gingerbread" houses, many of which were built in the nineteenth century. Visitors enjoy concerts in Ocean Park and rides on the Flying Horses, the oldest continuously operating carousel in the country. The streets of Edgartown, the island’s first settlement, are lined with upscale shops, art galleries, and fine restaurants. The stately houses, many of them carefully restored sea captains’ homes, are surrounded by well-manicured lawns and gardens. South of Edgartown is the area known as Katama. At the end of Katama Road is a three-mile barrier beach called South Beach, with surf on one side and protected salt pond on the other side. A five-minute ride on the "On Time," the 3 car plus passenger ferry from the Edgartown dock takes you to Chappaquiddick, an island off an island, with dirt roads lined with blueberry bushes and where you might see deer, osprey, otters, shorebirds, and turtles! Vacationers choose Chappy for the privacy and the tranquility this 6 by 3 mile spit of sand offers. By bike or kayak, explore the sand dunes and tidal ponds, the glacial moraine, and the sand plain grassland habitats. Fish for blues, bass, or bonito from some of the East Coast's best fishing places--the Gut, Wasque Point, and Cape Pogue. Enjoy the miles of unspoiled beaches accessible by 4-wheel drive. Join one of The Trustees of Reservations Nature or Lighthouse tours. Visit the 3-acre Japanese garden at Mytoi. Chappy offers miles of walking trails on the many Landbank properties. 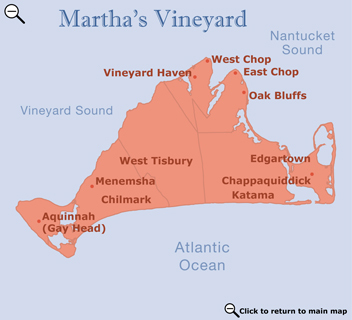 West Tisbury, Chilmark, and Gay Head are often referred to as "up-island." This region is rural and unspoiled, with stone walls, farms, and vineyards. West Tisbury hosts the popular Farmers’ Market twice a week from mid-June to mid-October. 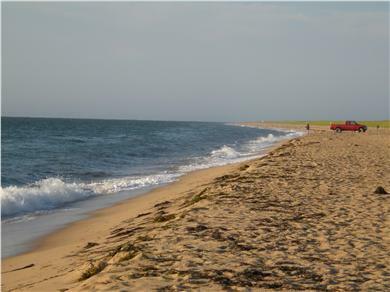 Chilmark is known for its rolling meadows and one of the island’s finest beaches, Lucy Vincent Beach. At the far western edge of the island are the windswept cliffs of Gay Head and Gay Head Lighthouse. The Gay Head cliffs provide 360° views of the sea and are one of most scenic attractions on the island. Visitors are enchanted by the rustic charm of Menemsha, the classic New England fishing village that was used for location shots in the film "Jaws." The catch of the day is unloaded from fishing boats and can be bought from markets along Dutcher’s Dock. Martha’s Vineyard is a haven for celebrities. Concerts, theatre, dance, and lecture series draw top talent.